The Annual BBBEE Commission Conference was held on Thursday, 14 March 2019 at the Emperors Palace Convention Centre in Kempton Park. This was no ordinary conference but one that included people from all over South Africa including, BBBEE professionals, State-owned entities, Government Departments, and Associations. The major topic for discussion was Ownership and BBBEE Ownership Transaction were at the forefront of the discussions. The Annual BBBEE Conference was honored with the Minister of Trade and Industry delivering the main address. Minister Rob Davies addressed the delegates on fronting issues which still prevail and have become the forefront for investigations as part of the work of the BBBEE Commission. The BBBEE Commission has become tougher on the fronting issues and committed to tackling these issues and bring these companies to book. 5 Star Compliance Solutions, Managing Director Linda Sewnarain lead the panel discussion as the leading verification agency at the BBBEE Commission. She delivered topics and experiences from her 12 years being in the industry as a technical signatory and the owner of a well-known BBBEE Verification Agency (5 Star Compliance Solutions) based in KZN. Linda Sewnarain covered topics including measurement of ownership, share register and share certificates, voting rights and real-life scenarios of challenges faced by BBBEE verification agency. Her presentation together with the keynote address by Minister Rob Davies and the BBBEE Commissioner, Zodwa Ntuli where highly informative and covered the important of the Ownership element being properly verified and points awarded based on sufficient proof and investigation when there is doubt. The measurement of Ownership involving trusts and NPOs were a critical discussion as measured entities are using these avenues as fronting opportunities. 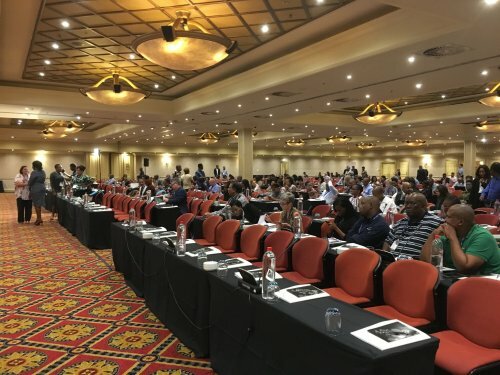 The BBBEE Commission Conference served as a platform to outline the work of the BBBEE Commission and some of the fronting cases reported and the type of remedies applied to resolve the invalid BBBEE Status. The BBBEE Commission was established as an arm of the Department of Trade and Industry as a watchdog to the implementation of the BBBEE Act. By ensuring that the BBBEE Act reaches its goals, the BBBEE Commission together with BBBEE verification agencies, consultants and other professional bodies like SANAS have an on-going task of ensuring correct practices are observed. The BBBEE Commission can be contacted via their website www.bbbeecommission.co.za or follow the commission on Twitter https://twitter.com/bbbeecommission .